Cubiescreen is made by Ybmaker team especially for the cubieboard2/cubieboard1 open source hardware. It is a small accessory / add-on board for CubieBoards. It can be used with CubieBoard1 and CubieBoard2. 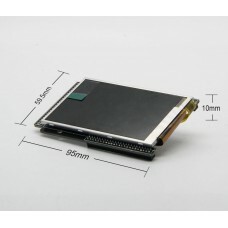 This board consists of 2 layers PCB, a piece of 3.5 inch, 800*400 resolutions LCD module comes with touch panel. Both of them form a complete product that very easy to use. When it is used with Cubieboard1/2, you just need to plug it into Cubieboard via 96 pin expansion header. So that it immediately becomes an all-in-one tiny computer with a display. The Ybmaker team and Cubieboard team supplied some Android and Linux demonstration images/ROM. We also supply the source code and user guide for you to do it yourselves.